We’re up! We’re down! This is great! I can’t go on. I finish up the dishes, dry my hands and head outside to open the nest boxes and check the animals. Within 10 minutes of washing the dishes I am walking through the cows and almost fall down in surprise. A fresh, wet brown bull calf is already standing next to flora and trying to nurse. Within 10 minutes! 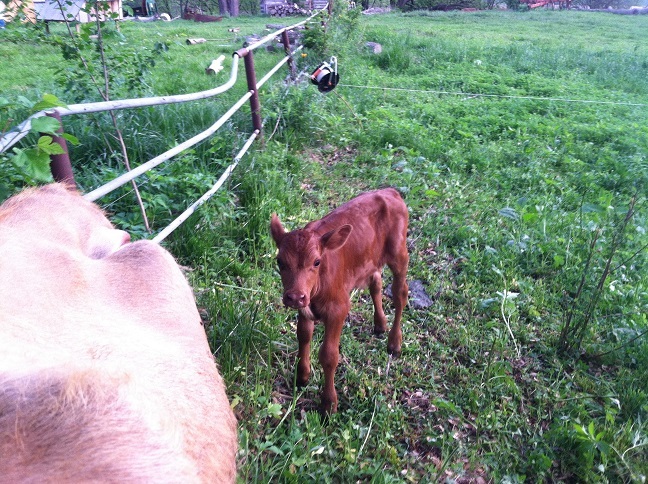 Here he is at 24 hours old. Good little guy. The kids are calling him “Steak” but I think we’ll choose something less…pointed. He is nursing well on all four quarters and running with the herd. Vigorous calf on an early May morning. What more could I want? Had he been born 12 hours earlier the story would have been different. Saturday night we got an inch and a half of rain and quite a bit of wind with cooler temperatures. All that rain…all that wind would have been hard weather for this little guy. Thank God he was born in the morning after the storm. But that brings us to the not awesome. We have month old pullets in our chicken tractors currently. 3 tractors, 50 pullets each. They are growing well and feathering out…doing everything a pullet is supposed to do on pasture. 46 of them piled and died in the rain Saturday night. There is no sense in it at all. Just a bucket full of dead birds…birds that didn’t have sense enough to get out of the rain. I don’t have words for the level of frustration we are feeling. Cackle Hatchery sent us 156 pullets, 155 made it out of the brooder and lasted until last night. Weather is always a factor and there is only so much I can do to plan for it. But I would never have imagined I could lose a full third of my birds to rain. We are up one calf. We are milking Flora again. But our future flock was just cut back dramatically. That’s the news…good and bad. This farming stuff is hard. This entry was posted in Cattle, Pastured Poultry. Bookmark the permalink. Sorry to hear that brother. I feel your pain. Farmers are eternal optimists. It’s in our blood. It’s so easy to kill and so hard to maintain life. Want a dead pig? No big deal. Want to keep a sick goat alive? Get on your knees and pray. That’s really all you’ve got. Step back a bit. Keep the goat from getting sick. Maintain health. It’s a whole lot easier to keep an animal healthy than it is to make a sick animal well. Let’s prevent rather than cure. For bonus points, apply all this life and death talk to personal relationships. It’s hard to fix a broken marriage. It’s important to keep small problems from becoming big problems. I could farm without Julie by my side but it wouldn’t be any fun. I could never replace Julie if she decided to leave. Every day I face a choice (and so does she). I can choose to nurture my present and future companion or I can nurse the wounds of yesterday. I choose not to allow yesterday to ruin today. And I have to make that choice a lot. So does she. We choose to be married…every day. I am proud of our livestock. I am proud of our children. But, more than anything else, I am proud of my marriage. The kids are growing into independence right before my eyes. Julie and I may have another 50 years of dependence on each other. I can’t allow wounds to fester. I know that seems off topic but it really isn’t. There was nothing I could do to save those birds but there are things I do every day to maintain health on my farm…all the way from the dirt to the gold rings. Wow! A video on youtube with polite comments! Practical Farmers of Ontario is where I found the link. Fascinating resource. Henderson says you would need 2,000 chickens if you had 100 cows. Just sayin. Your reply makes me think of the Serenity Prayer – you know, change the things you can, accept the things you can’t and pray for the wisdom to know the difference. Sorry about the loss of the chickens. They have such tiny brains…but it hurts when we feel like we could or should have done something, they’re so dependent on us. The investment in time and money too – just gone. @Kari – oh my goodness. Haven’t heard this song in decades. I didn’t think anyone East of the Rockies had even heard of them, lol. @ Dawn – lol Fortunately gov’t rules (that we generally hate as i.e. they say in my province you are only allowed 299 layers w/o a quota licence), also say to the Radio stations that you MUST play 35% Cdn content btwn 6 am and 6 pm so this uplifting west coast song has leapt over the Rockies and today even had an non-mandatory play in Illinois! 100 layers w/o quota out here. I’d forgotten the Canadian content rule. That is tough. Sorry to hear the bad news. But we get good along with the bad. Here’s to the Hope that tomorrow will be better. I’m sorry to hear about all those pullets…quite maddening. God will provide what is needed. Funny thing, that. A hen showed up yesterday with 8 chicks trailing behind it.